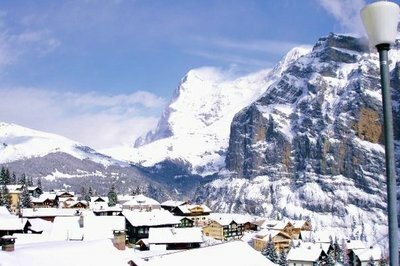 Mürren – Like a real life festive film! A fresh lining of dusty snow besprinkled the streets of Bern as we headed towards the hauptbahnhof that morning, and a low mist and biting chill whispered promises of crisp-white backdrops ahead. As the train set off for destination blizzard I fixed my gaze out of the window, keen not to miss even a millimetre of the immense scenery approaching. Everywhere I looked it was as if the train were zooming past life-sized Christmas cards. 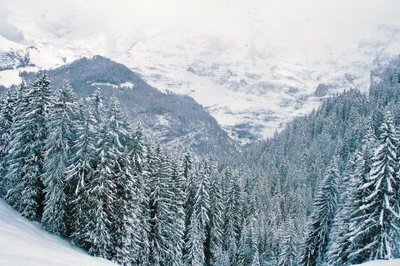 Beautiful stills of frozen, fluffy blankets and icing-dipped, gigantic trees flickered by, along with the perfectly picturesque alpine villages dotting the lakes of Interlaken. Gradually the mountains grew in a triumphant crescendo, dominating the skyline, their jagged tops glinting in the light. And the valleys became tighter, and icier as the sun struggled to creep over the dramatic summits. 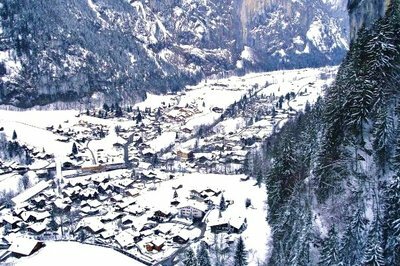 I soon arrived at Lauterbrunnen where I had to board a snazzy panoramic cable car which basically acted as a deluxe lift. The views during the ascent were utterly spectacular. 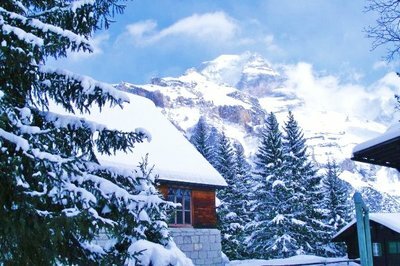 Perfectly shaped trees stretched for miles up and down the valley, giant and elaborate snowflakes, like those made by primary school children, gracefully bounced against the windows, and straight ahead the Eiger majestically and emphatically held my gaze. Our frosty great glass elevator eventually stopped at an old fashioned railway station where I boarded the small train that continued on to the village of Mürren. Niveous dunes could be seen for afar and an icy breeze composed a wintry waltz in the air. Piles of snow slumped against tree trunks and swamped the little log cabins that bespeckled the train line. We chugged along in slow motion, and eventually came to shuddering halt signalling our arrival in Mürren. The chilly stroll, or better said, epic trudge to the village was simply beautiful. A delightfully quaint miniature church stood enclosed in glittering diamond snow, its spire peeking out from the top. Perfect wooden houses lay engulfed in drifts with sharp, glistening icicles dangling from the roofs like decorative borders. And never far away were truly spectacular vistas of the Bernese Oberland.